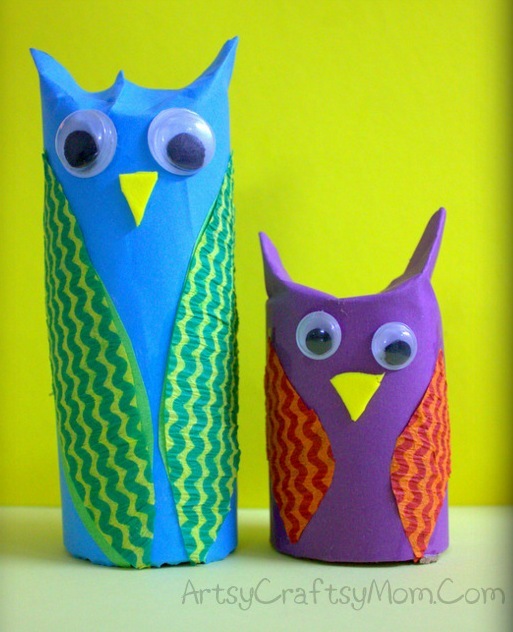 Parents – spend quality time with your children with these interesting art and craft ideas for kids and in the process create memories for a lifetime. Art and craft activities help in teaching kids creativity and imagination. It also helps them develop their motor skills, improve coordination, increases concentration and more importantly, keeps them occupied productively! If you want to spend some quality time with your children, try doing some crafts with them. Rest assured that you will come up with some quirky results that your child will be proud of. And in the process you will also be creating many beautiful memories to cherish for long! 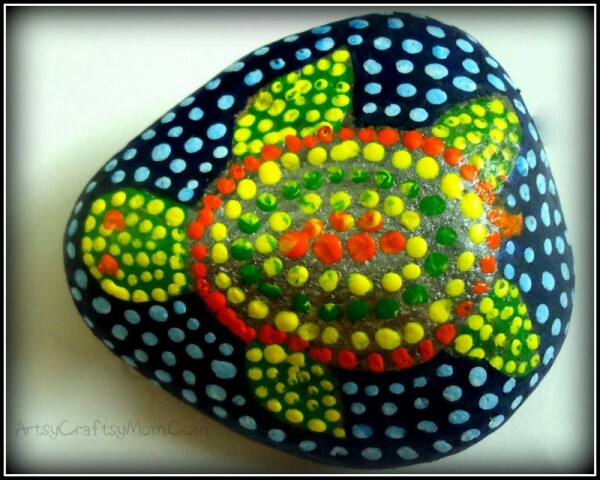 What could be easier than painting a roadside pebble and turning it into garden art? Here’s how you get going! Pick up some flat and smooth pebbles from your next riverside trip. When you are ready to start crafting with your child, choose a pebble from your collection and paint the whole pebble dark blue using acrylic colours and a sponge. Now trace any pattern like a fish or a turtle on it using a pencil. Following this, paint the turtle silver using a brush. Let dry completely. Once dry, apply uniform dots in orange colour around the border using ear buds. Use alternate colours to apply dots to fill in the turtle design. Use light blue colour and add dots outside the turtle design. Voila! Your very own personalized stone art is ready! Stamping crafts is so much fun to do since most of the materials are already present in the house! Place an old newspaper (Folded atleast half an inch thick) between the layers of the T-shirt to prevent seepage of colour. Cut the potatoes into smooth halves. Then cut a wedge shape on the backside to make a handle. Pat the potato dry using a tissue. In a paper plate add some blue acrylic colour. Do not dilute. Rub the large potato half in it (smooth side down) till the blue covers it completely. Press hard on the T-shirt and lift carefully. Now repeat the same with the smaller potato to form the wings as shown in picture. Let dry. 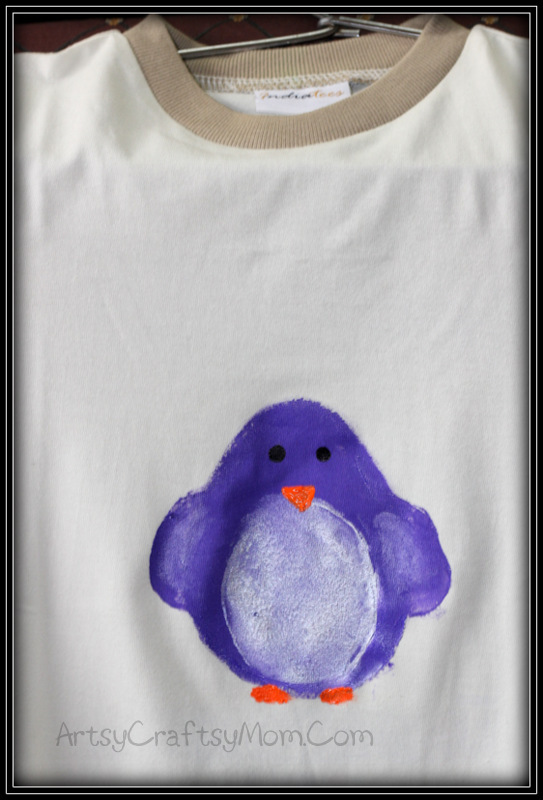 Use a new half to dip in white colour and print on top of the blue to form the stomach. Let dry completely. Using a paint brush add 2 dots for the eyes. Use orange colour to add feet and a tiny beak. Help your child surprise a loved one on a special day – be it Mother’s day, Father’s day, birthday or just like that – an anyday gift for someone special! Arrange the ice-cream sticks two on top of the other two to form a square. Secure them in place using fevicol. Let dry. Using fevicol decorate the frame using sequins, glitter, sand and shells. Make sure all the sequins are stuck firmly onto the frame. Make a mixture of 1 part fevicol and 1 part water and apply a thin coat all over. Let dry completely. Cut the photo to size and paste behind the frame. Secure a magnetic strip and use as a fridge magnet. An effective way for teaching kids about recycling is to set an example at home. Reuse stuff lying around the house and craft with them. Cut the kitchen roll into a 5 inch tube. Cut the construction paper to form a 6 inch by 6 inch square. Wrap around the tube so that one inch is extra and secure in place using glue. Now pinch the construction paper and fold to form ears. Cut the pattern paper into two leaf shapes. Paste to form wings. Paste googly eyes. Finally cut the foam into a triangle and paste to form the beak. Most kids love messy hands and messy play. So it’s time to get your hands dirty! 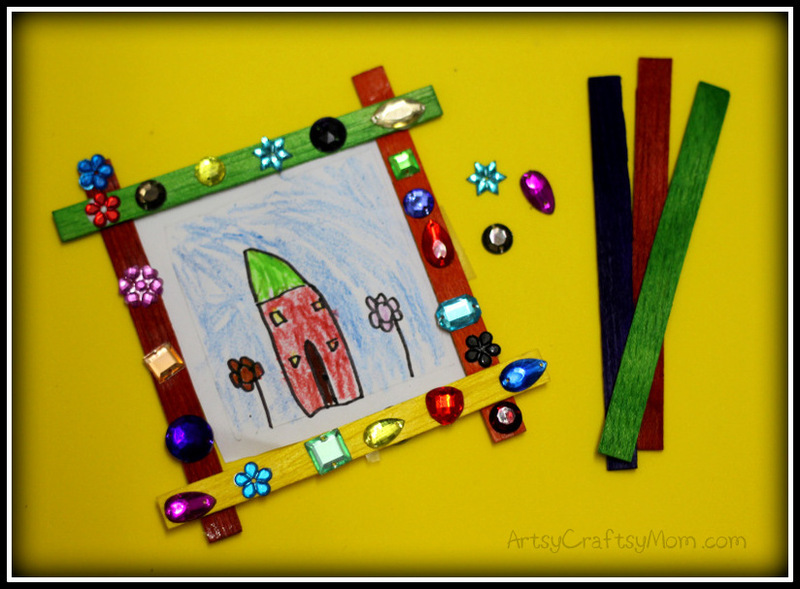 Here’s a craft that acts as a keepsake and can even be framed. This can also be painted onto a card for Easter. Place the paper firmly on the ground. Take some white paint and paint the whole palm using a big brush or a sponge. Stamp onto paper. Wait for 5 seconds before lifting it up. Wash hand. Using the pointer finger dab on some red and yellow feathers. Paint some chicks by using a finger to paint a yellow circle for its face and a larger circle for its body. Paint some grass using green color again using fingers. Add red plumes, feathers, feet using a paint brush. Draw eyes using a marker. We hope these ideas will help all you Indian moms out there to have a fun time at home while also teachings kids some useful skills! *Art & craft photos credit: Shruti Bhat. About The Author: Shruti is well-known in the blogosphere as the Artsy-Craftsy mom! She juggles her full time job with her passion for crafting. 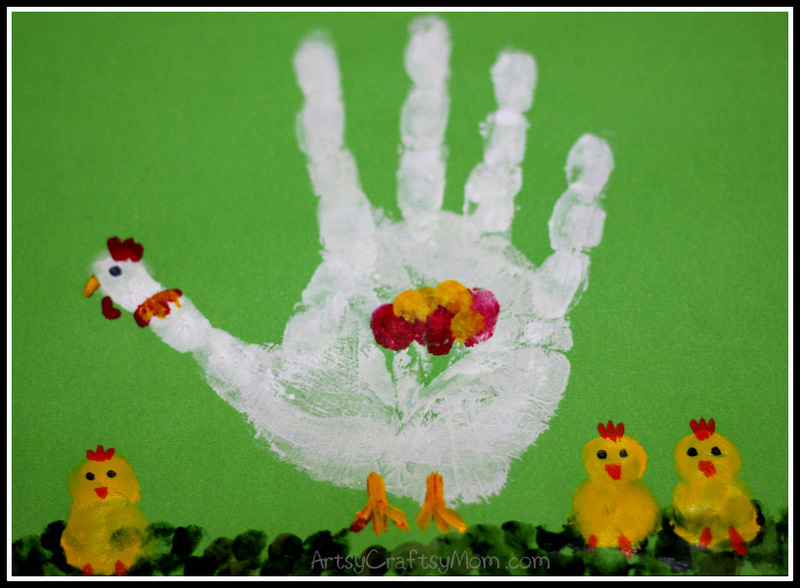 Her blog is full of innovative yet easy-to-do art and craft ideas for kids. This is so cute…yet so innovative and useful….I just loved it !! @Meghna – Thank you so much. Wonderful ideas! Looking forward to more such articles..specially the ones where we will be able to understand and explain the life and work of famous artists to our children..
@chandrima – that’s one of my favorite topics… but it caters to slightly older kids. Good supportive pics and ideas! Nice ideas. Worth making. Please give more such creative ideas. Super creative ideas and art. Among so many ideas Recycle was my favourite. Will definitely try them.